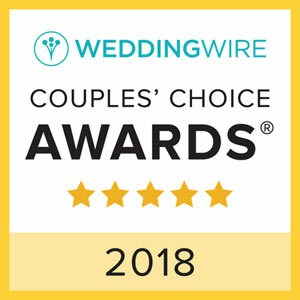 Being among the top 5% of skilled professionals on WeddingWire garnered us one of the most sought-after wedding catering awards—the Couples’ Choice Awards. Because the compliments come straight from loyal clients who are glad they trusted our expert team with their unique vision, this is a huge honor. Cultivating wedding dreams is our passion, and we are overjoyed that our creativity and dedication are a winning combination. Based on overall rating, total number of reviews, 2017 review performance and consistency of reviews from year to year, we deliver on all accounts. Because we are known for our meticulous attention to detail, that comes as no surprise! To join the overjoyed couples who are glad they chose our experienced Philadelphia catering team to deliver a custom-designed menu and superior service to their wedding, contact us online or give us a call at 610.725.9420.